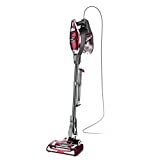 Shark Rocket HV301, HV302, HV305, HV321 and HV322 Ultralight Upright vacuum cleaners are a group of very similar Shark Rocket vacuum models – they are easy to use, lightweight, come with many cleaning attachments, they are easily convertible from upright to handheld vacuums and they come at reasonable price. They can be used as second home vacuum cleaner for emergencies and covering areas that larger vacuums can’t cover, but they can be easily used as main vacuums for smaller homes. HV301 is the most basic model of these 5 models – main differences are in the available attachments and the type and construction of the cleaning head. (Amazon links, open in the new window). Again, differences are mostly in attachment types. 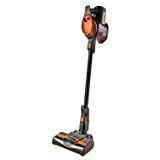 Shark Rocket Ultralight Upright vacuum cleaners are very configurable – cleaning wand is easily removed, which transform these uprights into powerful, corded, handheld vacuum cleaners. They have ergonomic and comfortable handle with rubberized grip which prevents slipping and provides more control when vacuum is used even with a single hand. However, when converted into handheld vacuum, they are not the lightest handhelds on the market, but they can be easily used by elderly people and even kids. Since the are corded, with 500 W motor, they don’t lose suction due to empty battery and with 30 ft (9.1m) long power cord, they have great range of action using single power outlet. Brushroll switch is positioned near the handle, enabling one to switch on (two speeds) and off motorized brushroll. Such motorized brushroll clean carpets and area rugs by removing dirt embedded deeply in carpet fibers. Dirt cup is easy to empty and clean. It is made using transparent plastic and one can see how full it is. Shark Rocket Ultralight Uprights are designed so that they don’t lose suction, regardless how dirt cup is full. 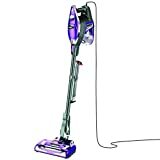 Cleaning wand can be removed easily – it enables one to reach anything from the floor to the ceiling and without it, these vacuums can be used as handheld vacuums. Filters are washable and don’t need replacement. They do their job well, but they are not HEPA grade filters, which is very important for people having asthma, allergies and similar health issues. Wall mount enables storing of the vacuum cleaner (using storage hook on the vacuum) and accessory bag onto the wall. This can save space in certain situations and often keeps the vacuum nearby, ready to be used when required. Swivel steering and lightweight design enable easy maneuvering with these vacuums around furniture and in tight places. When other surfaces needs to be cleaned – upholstery, stairs etc – simply change the cleaning tool according to the cleaned surface and/or type of dirt. 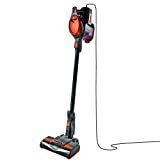 Dyson DC35, DC44, DC59 And V6 handheld cordless vacuums are group of vacuums that are very similar in appearance to Shark Rocket Ultralight Uprights. They are all easily converted from upright vacuums to handheld vacuums and vice versa by removing or adding cleaning wand. Dyson vacuums are cordless vacuums and although they use lithium ion batteries, their operation time is limited to about 10-15 minutes, depending on how they are used. This operating time is even shorter when special ‘boost’ mode is used. On the other hand, Shark Rocket vacuums provide 500 W of power constantly due to rather long power cord – if there is a power socket around, Shark Rockets can be used, while Dyson V6 can be used regardless of presence of power sockets or mains power of any kind – in the car, on the boat etc. V6 and other handheld cordless vacuums are better suited as ’emergency’ vacuums, unless you don’t mind pulling power cord behind. Note that Dyson V6 Absolute provide HEPA grade air filtration. Dyson V6 costs much more than HV301/302/305/321/322 vacuums. These Shark Rockets are very similar and their price vary +/- $25. 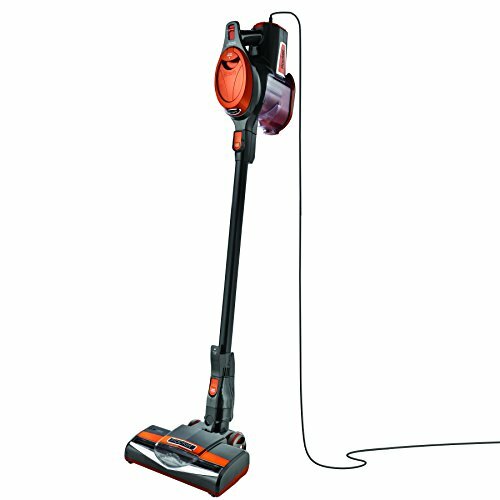 If you don’t mind spending a little bit more money, go for Shark Rocket TruePet Ultra-Light Upright (HV322), or perhaps Shark Rocket Ultra-Light Upright Vacuum (HV323). They cost more than other models due to available set of cleaning tools, but they get their job done on carpets, rugs and bare floors, regardless of the dirt type. It is quite possible that some people will never use some of the cleaning tools and buying them is money wasted. So, if you believe that you will never actually use all available attachments, go for cheaper model. On the other hand, if they are required after some time, they can be purchased separately at higher price per item.